BrassNeck are delighted to be able to announce that we have secured the rights to the Tony Award winning Best Musical, Spamalot! A new musical lovingly ripped off from the film “Monty Python and the Holy Grail”, Spamalot tells the tale (loosely!) of the Knights of the Round Table as they join King Arthur on his quest for the Holy Grail. Taken from the original screenplay by the comedy genius team of Graham Chapman, John Cleese, Terry Gilliam, Eric Idle, Terry Jones and Michael Palin, Spamalot takes King Arthur’s band of questionable Knights from Camelot (via Finland) on a journey that brings them face to face with Finnish villagers, lewd French soldiers, various barnyard animals, the Knights of Ni and the mystical enchantress, the Lady of the Lake in a riotous adventure that will leave you weak with laughter. 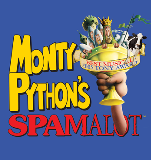 Spamalot is to be staged from 15th to 19th November 2016 – the Box Office will be open as soon as our production of The 39 Steps concludes in May.